Where there is “bo-ho-horedom,” there is poor communication at work. A Hippocratic oath is needed that says there are no boring subjects, only failed communicators. FROSTED FLICKS. 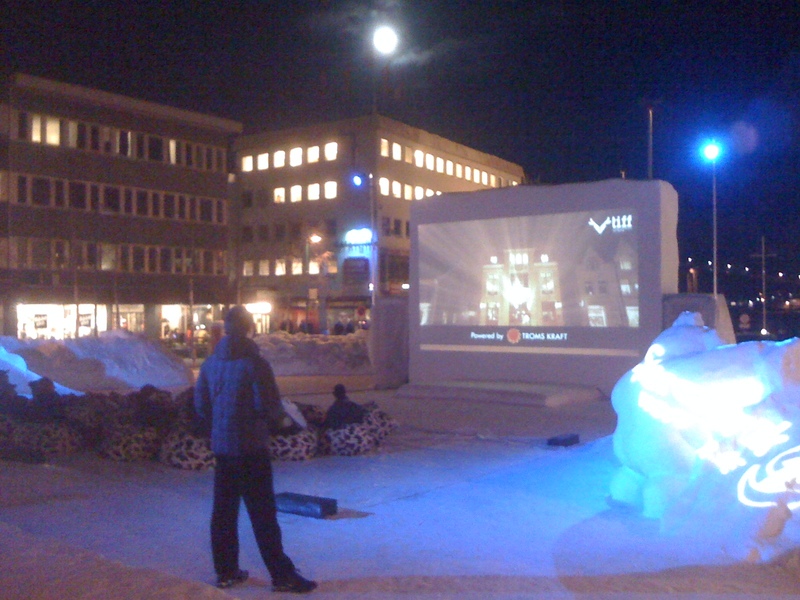 A group of hearty souls sit in beanbag chairs in 25 degree weather for an outdoor screening beneath the moon at the Tromso International Film Festival (where “Sizzle” is screening twice). Needless to say, I asked that my movie be shown at the indoor cinema. I’m in the wonderful, wonderful winter wonderland of Tromso, Norway this week for a non-stop, 10 day marathon which, if the next 9 days are anything like the first one (we closed the pub down at 3 a.m. this morning), it’s going to be exhausting. The people here are sooooooooo nice. And happy. And positive. And agreeable. Which is the perfect set-up for an obnoxious Yank from Hollywood to come in and spoil paradise by calling everything bo-ho-ho-ring. Which is sort of what I did yesterday on the opening panel discussion of the first event here — a 3 day conference of Nordic science communicators. At any rate, my taking exception caused the panel discussion to end on kind of a sour note (leave it to me). These Scandinavian people are such conflict-avoiders. They are so sweet. At the reception, people told me that what I said was funny — that their panels ALWAYS end with everyone in complete agreement on the topic. But they also agreed with my statement. No one should say, “Well, some topics are boring and can’t be communicated.” You only need two things — resources (time, energy, money) and creativity. And that’s the fundamental problem with science communication: the science world is unwilling to provide the needed resources and doesn’t take any interest in creativity/novelty/innovation. Which adds up to a lethal combination that’s the main reason science communication is so bad. And the main reason a topic like global warming ends up being seen as boring.